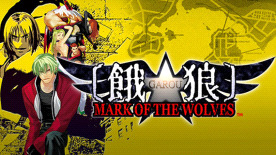 "GAROU: MARK OF THE WOLVES", the latest entry in the legendary "FATAL FURY" Series which still continues to fascinate players around the world to this day, returns for a new fight on Steam! Pick up a fighter from the 12 (+2) characters available, and fight your way via the "T.O.P. System", "Just Defended", and "Breaking" new battle mechanics in the "King of Fighters: Maximum Mayhem" tournament, held this time in Second Southtown. Connect to Steam and fight the hungriest wolves in "GAROU: MARK OF THE WOLVES" via the "Invite a Friend" & "Lobby" multiplayer features for the hottest battles ever! Check your current rank & score in "GAROU: MARK OF THE WOLVES" at any time, as well as those of your friends and other top fighters! Configure all types of video options, controls and volume sound settings to your preference for the most pleasant "GAROU: MARK OF THE WOLVES" experience ever.